Throughout emergency rooms in Southeast Michigan, there are patients in the midst of a psychological crisis — and they're waiting, sometimes for days. And healthcare organizations report that the amount of time it takes for people to go from diagnosis to being admitted to a hospital psych ward is growing, partly because of shortage of available beds and partly because of growing demand in a state where suicide rates and substance abuse are rising. Solutions exist, but they will have to overcome obstacles that have minimized people with those problems, placing them at a lower priority for funding and treatment than those with similar physical conditions such as diabetes, heart disease or cancer. And the problem goes beyond treating the patients themselves. While waiting in the emergency room, patients may become disruptive, interfering with care for other patients. They sometimes become combative and pose a safety risk for themselves, staff or other patients. Finally, hours later — studies show 21 hours or more on average in Wayne County for difficult patients — an inpatient psychiatric bed is found that fits their diagnosis. The long waits are sometimes referred to in the industry as "ER boarding," housing patients for long periods while they wait for an available psychiatric bed. Lack of a timely admission and even just waiting for a diagnosis also leads to poorer outcomes for behavioral health patients and other patients in the typical ER, Sanford Vieder, D.O., chair of emergency medicine at Beaumont Health, and other experts tell Crain's. Vieder said that last fall, Beaumont Hospital in Farmington Hills had 16 patients in its ER who waited more than 48 hours each because the hospital had no available psychiatric beds or could not find other hospitals willing to take them. Beaumont has a 25-bed behavioral unit in Farmington Hills and 30 beds in the psych unit at the flagship Royal Oak hospital. They are almost always full. The system operates 87 psychiatric beds and is building a new 75-bed psychiatric hospital in Dearborn. And demand is rising. In 2018, Beaumont's eight hospital ERs saw 18,000 patients with a mental health diagnosis, up 13 percent from 16,000 in 2017. "The greater the numbers, the greater the stresses on the system," Vieder said. "The unfortunate piece is the ER is a safe place for patients who are having an acute issue, but not the best place for (those with behavioral problems). They may be acting out and violent. We try to separate them out from other patients and make sure they are safe and get them definitive treatment for their specific issues as fast as we can. It is complex because sometimes they have other medical problems." Ascension St. John's Hospital in Detroit also is seeing rising numbers of incoming psychiatric patients. St. John's emergency department averaged 17 psychiatric consultations per day in 2018, a 21 percent increase from 14 in 2015. St. John handled 6,205 behavioral health consultations in 2018. "We are still significantly challenged with that problem of way too many psychiatric patients in our ERs for extended lengths of time," said Stephanie Brady, vice president of care transition with Ascension Health Michigan. And despite adding staff, Brady said the time it took to admit a patient at a St. John facility — after they were medically clear and approved by insurance — increased by 12 percent to 12.8 hours in 2018 from 11.4 hours in 2015. However, when a St. John bed is unavailable or inappropriate for a particular patient — for example, if they are an adolescent, or aggressive — the time it took to transfer them to another inpatient unit grew by 36 percent to 24.1 hours in 2018 from 17.7 hours in 2015, she said. For patients with less urgent problems, discharge time to community behavioral health programs also increased 32 percent to 9.9 hours in 2018 from 7.5 in 2015, primarily reflecting slowness within the ER because of high patient volume but also lack of services in the community, Brady said. Nationally, a study of more than 6,000 ERs found 70 percent reported boarding psychiatric patients for hours or days, with 10 percent of patients boarded for several weeks, said the National Association of State Mental Health Program Directors. 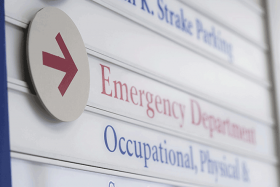 Another study found that 61 percent of hospitals did not have psychiatric staff caring for the ER patients while they waited, said the American College of Emergency Physicians. While the studies were conducted several years ago, Michigan experts told Crain's they believe the situation has worsened. In the 1980s and 1990s, Michigan closed more than 30 psychiatric hospitals as part of a national trend that started in the 1960s to de-institutionalize mental health, use more modern anti-psychotic drugs and move more care to outpatient settings. The problem: Many states, including Michigan, failed to expand outpatient care to keep up with demand. Then, to make matters worse, underfunded public community mental health services. As a result, hospital ERs, jails and prisons became overburdened with people with severe psychiatric, substance abuse and other conditions. "It is important to keep in mind that this is more than a place issue (hospital ERs) but is a systemic issues that warrants implementing new models of integrated (physical and mental health) care," said Jim Haveman, president of the Haveman Group and director of the state Department of Community Health from 1996-2003 and from 2012-2014. At Henry Ford Hospital, Jennifer Peltzer-Jones, R.N., a senior ER staff psychologist, said a more than doubling of psychiatric patients to 3,000 annually the past few years — half of whom require admission — necessitated hiring more trained mental health staff to serve the busy ER on a 24-7 basis. "Lots of things are happening. The patient walks in the door, then waits to see a nurse, see a doctor, see specialists. We talk with family. Then the decision is made that a patient needs to go into the hospital. We get whatever insurance involved and we find a bed," she said. "If I am taking 12 hours to get insurance involved, that is on me." From 2015 to 2017, Henry Ford cut median psychiatric evaluation time from 12 hours to about three hours, Peltzer-Jones said. It then takes five more hours for insurance approval, down from eight hours in 2015. By collecting data on psychiatric patient wait times for beds, Peltzer-Jones said she had proof of high utilization to show bosses to request extra staff. The extra staff helped the ER cut time for evaluations, insurance approval requests and bed placements, she said. "We work really hard to get the mental health team involved as early as possible," she said. But the time it takes to find a psychiatric bed varies greatly because of a dysfunctional system, Peltzer-Jones said. In more than a dozen interviews with local experts, Crain's found multiple opinions on how long it takes to get insurance approvals and then actual bed placements for psychiatric patients that ranged from eight hours to more than 48 hours, depending on the severity of the patient's condition. Standardized procedures where hospitals, agencies and payers evaluate patients the same way and agree on common tests and labs for insurance approval and bed placement. Expansion of community mental health crisis centers or psychiatric urgent care centers that can take on some of the patients entering hospital ERs. People would use these centers for walk-in care, or hospitals could transfer medically cleared patients to screening units at the centers to wait for a bed and for treatment, rather than having them sit and wait in an ER. Changing certificate-of need bed regulations to force hospitals that "hoard" psychiatric beds and don't staff or operate enough of them to "use them or lose them." This would potentially free up licensed beds for facilities that will use them. Or the state could simply increase the number of psychiatric beds allowed in a region with shortages. Creating an online psychiatric bed registry where hospitals would be required to report on open beds and what type of patients they can take, which would speed the process of locating beds for patients. Increasing payment for behavioral patients admitted to the hospital and creating more inpatient psychiatric reimbursement codes for patients with worse problems. For example, new psychiatric "ICU" reimbursement level codes could give hospitals a financial incentive to open higher-acuity beds and provide additional revenue for appropriate staffing. Expanding training programs for psychiatrists, psychologists, psycho-pharmacologists, advanced practice nurses and social workers to staff hospital ERs and crisis centers, and paying higher salaries and expanding benefits for these professionals. Developing new technologies to help manage ER clearance and transfer protocols. Expand psychiatric telemedicine programs to get quicker diagnoses, especially in small or rural hospitals that don't have access to in-house expertise. Mental health agencies and hospitals are beginning to consider investment in mental health crisis centers as a way to steer patients away from busy ERs, allow for referrals once patients are medically stabilized and provide alternatives for walk-in patients. But Michigan doesn't have enough such centers, and regulatory and legal barriers exist that prevent more from opening, experts tell Crain's. More crisis centers, which some call psychiatric urgent centers, won't solve the problem, but it would be another way to reduce boarding, they say. Only a handful of crisis centers are open in Southeast Michigan: Common Ground's in Pontiac and Hegira's in Livonia. Last fall, the Macomb County Mental Health Authority completed phasing out its two-year-old behavioral health urgent center because of funding problems related to 24/7 staffing and regulatory concerns. It now offers a crisis hotline and same-day open-access services at its clinics. Three more crisis centers plan to open, in Ann Arbor, Grand Rapids and Detroit. Marianne Udow-Phillips, executive director with the Center for Health Research and Transformation in Ann Arbor, said the basic problem is behavioral health services are underfunded and there aren't enough available inpatient psychiatric beds for seriously and chronically ill patients. Udow-Phillips said there is a great need for outpatient crisis centers that can serve people under mental stress. "We need more places people can go before they go to a hospital ER," she said. "The only places doctors can send people is to hospital ERs." Last year, Washtenaw County passed a special millage to fund behavioral health services. Part of the funding will go to opening a walk-in crisis center in Ypsilanti. It will be open 24 hours a day and provide a full range of observation, assessment, support and stabilization services. In Grand Rapids, Pine Rest Christian Mental Health Services, a 198-bed inpatient psychiatric hospital and outpatient mental health provider, plans to open in April its first psychiatric urgent care center, said COO Bob Nykamp. The 3,000-square-foot center will be staffed by more than a dozen mental health professionals, including psychiatrists, psychiatric nurse practitioners and psychiatric physician assistants. "Eighty-five percent of psychiatric patients (entering the ER) don't get admitted to a hospital. They should have not gone there in the first place," Nykamp said. "If you are playing basketball and break your ankle, you don't go to a hospital ER, you go to an urgent care. ... It is the same thing with mental health." The Detroit Wayne Mental Health Authority has plans to open one crisis center in Wayne County near the Boston-Edison neighborhood off Woodward Avenue and could open two more in the coming years, said CEO Willie Brooks. Peltzer-Jones of Henry Ford said she supports expansion of crisis centers, but there needs to be more than one in Wayne County because of its size. But there are regulatory and statutory barriers discouraging more psychiatric urgent cares from opening, said Rae, who is on a private work group of mental health executives planning to create a better business climate for more crisis centers. "The (state mental health) code is a barrier to having more crisis centers. It is very outdated because it was written in the 1970s and assumed there were enough psychiatric beds in hospitals that would accept anyone," Rae said. "There aren't enough beds for the population." To address the problem, the Partners in Crisis Services work group is working with behavioral services healthcare attorney Greg Moore of Dickinson Wright PLLC in Troy to develop a white paper that they hope can lead to legislative solution and ultimately more outpatient community mental health crisis centers across Michigan. Moore said three barriers exist that discourage crisis center development. Two of the barriers are language in mental health codes that limits the time centers can hold patients in preadmission screening units to 24 hours after a diagnosis is made, and restrictions on using restraints for aggressive mental health patients. The other has to do with antiquated state law on who may transport patients to non-hospital facilities, essentially preventing ambulances from dropping off patients at crisis centers after they have been to a hospital. "Michigan's mental health code has simply not kept pace with the clinical and social advancements in crisis services," Moore said. Nykamp said updated and common-sense rules in Michigan could allow crisis centers to take patients with moderate psychiatric problems and avoid hospital ERs. There are several successful community mental health crisis models across the nation, including systems in California and one in Arizona by Connections Health Solutions in Tucson and Phoenix, that have worked with their states to modify or get around burdensome regulations for good public health and safety reasons, experts said. Rae has traveled to Connections in Arizona to observe what she says is one of the nation's best crisis services. Connections operates two large mental health crisis centers, essentially freestanding emergency departments, where people walk in for services and ambulances are allowed to take people with psychiatric problems. Dom Pallone, executive director of the Michigan Association of Health Plans, said expanding the number of crisis centers could reduce the burdens of hospital ERs. "Once a (patient) is in an ER and stabilized, we would be supportive of taking them for follow-up care to a crisis center," Pallone said. "That could help with the boarding problem." Vieder said an expansion of mental health urgent care centers would relieve hospital ERs from non-emergency cases. "It also might help (prevent) the delusional, psychotic or depressed person (from getting) to the point where he strongly considering taking own life," he said. "For the more severe cases, it is more difficult to bypass ERs," he said. "We are required to do the right thing by people. It might be low sodium level because you have diabetes that results in a acute mental health status change. We need to assess that first." Nykamp, who also is chair of the behavioral health services committee at the Michigan Health and Hospital Association, said he supports the development of psychiatric "ICU-type" reimbursement payment codes, similar to the multiple ICU reimbursement codes for medical conditions. The MHA is discussing a plan to advocate for variable inpatient rates for psychiatric services based on acuity to address lack of bed availability and required staffing, Nykamp said. In a statement, the MHA confirmed with Crain's it is working on various policies to address hospital ER psychiatric boarding. "Those efforts focus on improving access to behavioral healthcare to ensure that patients receive the care they need, when they need it, in the appropriate care setting," MHA said. Helen Stojic, director of corporate affairs with Blue Cross Blue Shield of Michigan, said payers follow codes developed by the American Medical Association. She said the codes went through an overhaul in 2013 and Blue Cross monitors and reviews code changes carefully. Bret Jackson, president of the Economic Alliance for Michigan, said he also supports greater behavioral health reimbursement that could increase staffing of psychiatric units that can limit available beds. He said it could be resolved by changing payment models "so medical facilities will make room for psychiatric beds." Nykamp said better treatment of psychiatric patients can also reduce medical costs. Studies have shown that every $1 spent on behavioral health services saves $4 to $6 on the physical health side. "Behavioral health is a good investment. Developing a system to pay for a relative cost for the ICU payments will save significant dollars on the medical side of equation," he said. George Mellos, a psychiatrist and director of behavioral health with the state Department of Health and Human Services, told Crain's that low inpatient payments for psychiatric services is frustrating for providers because they are revenue starved when it comes to treating patients. Mellos also is medical director of the Hawthorne Center in Northville, a 118-bed public psychiatric hospital for children and adolescents. "We need a more sophisticated coding system in behavioral health," said Mellos, adding that advocacy for higher payment rates is beyond the scope of the state's efforts. Matt Owens, vice president of network operations with Oakland Community Health Network, which oversees and finances Medicaid inpatient psychiatric admissions, said that in October 2017 the organization increased inpatient rates to hospitals from $639 to $650 per day. He said OCHN also sometimes offers higher rates, as much as $1,200 per day, when more intensive staffing is required as a way to ensure an admission. "We have not observed an increase in bed access" with the payment increase, said Owens, adding there are a number of factors that influence whether hospitals have open psychiatric beds. Pallone said he isn't sure whether increasing reimbursement would encourage hospitals to add more beds or staff. However, he acknowledged that "some (access to bed issues) has to do with reimbursement to the system." One of the problems hospitals struggle with is low payments by Medicaid. "It has to be the lowest by law, but you can't survive just on Medicaid because there is not enough funding," Nykamp said. For example, Nykamp said Medicaid only pays $40 for a psychiatric evaluation compared with about $250 by Blue Cross Blue Shield of Michigan and other commercial payers. There are other reasons why hospitals refuse to admit some patients. Hegira Health Executive Director Carol Zuniga said some hospitals are leery about admitting some patients because they "fear it will be difficult to discharge them, especially if they don't have somewhere to live." Hospitals also say their units are not always designed and staffed for the type of patients seeking admission. Or the patient has been at the hospital before and caused damage or attacked staff. "I sense it is an excuse, but I have to empathize with the hospitals," Zuniga said. "Some patients are very difficult people." Peltzer-Jones agreed that hospitals sometimes refuse to accept psychiatric patients because they are too difficult. "It is not the diagnosis. We accept patients who are medically sicker. We have medical ICU beds that are staffed two patients for one nurse. No one argues that," she said. "For some reason we don't mimic that for mental health patients. We know patients need more intervention, but we won't fund in the same way." For example, medical ICUs are funded at a higher level than general medical departments or ER observation units. "We don't have that different funding levels for mental health that would allow for different staffing requirements," Peltzer-Jones said. "There should be a psychiatric ICU level of reimbursement," she said. Common Ground CEO Heather Rae said hospitals often make the following tough decision. "You have one bed available and you are presented with two patients for admission. Do you take the patient who might hurt staff? Or a patient with (mild behavioral health diagnosis) who has diabetes and high blood pressure who will not hurt staff?" Rae said. "It is easy. You take patient B." Zuniga said she believes if hospitals were reimbursed more for higher level acuity patients they would increase beds and staffing. Rae said Common Ground gets more than "1,000 hospital denials a month. Many times it is a highly aggressive person who has co-occurring symptoms like developmental disabilities or substance abuse problems. No hospital wants those people. They want patients with less challenges." Hospitals, on the whole, have enough beds for moderately ill patients. "There are not enough beds for patients who have co-occurring problems or those who are highly aggressive," she said. Vieder agreed. He said hospitals need higher funding levels from all payers. "If insurance companies understood we need more funding for our high acuity patients that would be a big help," he said. "Another is we need more physical beds in Southeast Michigan. That number has declined over the years" after many state psychiatric hospitals closed. In Michigan, there are 60 private psychiatric hospital units with 2,148 licensed beds and another 276 private beds in 10 units to serve child and adolescent mental health needs. Nobody at the state or in private practice knows how many of these beds are staffed and actually in use. But the occupancy rate for the licensed beds is 69 percent, state officials said. One proposal being developed by the MDHHS is to create an online psychiatric inpatient bed registry. Last December, the Legislature approved funding for the registry and plans are being developed to launch one this year. Pallone said a bed registry can help insurers and mental health agencies find inpatient psychiatric beds for patients. "It is not a silver bullet, but (finding) available bed space is problematic for commercial insurers, like Medicaid, but it is not just a Michigan program, it is a national access problem," Pallone said. While the state's bed registry work group is seeking to help Medicaid, Pallone hopes the online solution can help in commercial health insurers as well. "We have issues with calling around, just like everyone else. It is a search and find function. Payers know the list of beds in an area and literally have to make cold calls in networks inquiring whether they have space or capacity. They are told no, not the right type for the needs of the patient, and move on down the list looking for an available bed," he said. But even with a bed registry, from Zuniga's perspective there absolutely is a lack of psychiatric beds. "People should not be waiting days for a bed." "Emergency rooms fill up with psych patients — and then they wait" originally appeared in Crain's Detroit Business.